This topic describes how to deploy SharePoint Web applications via Forefront Unified Access Gateway (UAG) in a topology in which the server running SharePoint Products and Technologies publishes multiple Web applications on a single port. A server running SharePoint Products and Technologies publishes multiple Web applications on a single port, each with a unique host header. Each SharePoint Web application is published via only one Forefront UAG trunk. The public address of the SharePoint site is different from the internal address of the site. External users access the SharePoint site over HTTPS; internal users access the same site over HTTP. You must perform the following procedures on the server running SharePoint Products and Technologies, and on Forefront UAG. You can repeat these procedures to publish as many SharePoint Web applications as required, via Forefront UAG; however, you cannot publish the same SharePoint Web application more than once on each Forefront UAG trunk. Configuring Forefront UAG settings—Configure the Forefront UAG server to add a SharePoint Web application to the trunk. Configuring the server running SharePoint Products and Technologies—Configure the server running SharePoint Products and Technologies to add a SharePoint Web application. This procedure describes the steps you must do on the Forefront UAG server to add SharePoint Web applications to the trunk. In the Add Application Wizard, on the Select Application page, click Web, and then in the list, click Microsoft Office SharePoint Server 2007 or Microsoft SharePoint Server 2010. Do not publish the same SharePoint Web application twice on the same trunk. If the application was published via this trunk before alternate access mapping was supported, remove the existing SharePoint Server 2007 application from the trunk, and then add a new SharePoint Server 2007 or 2010 application. In the Addresses box, enter the public host name of the SharePoint Web application (for example, HRPortal). Do not enter the internal host name of the load-balanced SharePoint site or of the server running SharePoint Products and Technologies. In either the HTTP Port box or the HTTPS Port box, enter the port via which the application is published. In the Public host name box, enter the public host name of the SharePoint Web application, and then click Next. For more information, see About public host names. Note that the Replace host header with the following option is not relevant for this topology, and the box should be left empty. Make sure that you read About rich clients and MSOFBA before you select this check box. After the configuration is activated, the message "Forefront UAG configuration activated successfully" appears. This procedure describes the steps you must do to configure the server running SharePoint Products and Technologies to add a SharePoint Web application. On the server running SharePoint Products and Technologies, open the SharePoint Central Administration tool. In the SharePoint 2010 Central Administration tool, under System Settings, click Configure alternate access mappings. When using SharePoint Server 2007, in the SharePoint 3.0 Central Administration tool, click the Operations tab, and then under Global Configuration, click Alternate access mappings. On the Alternate Access Mappings page, in the Alternate Access Mapping Collection list, click Change Alternate Access Mapping Collection, and then, on the Select an Alternate Access Mapping Collection dialog box, select the application that you want to publish. On the Edit Public Zone URLs page, in a zone box that is not yet defined, such as the Internet zone, enter the URL of the same public host name that you entered in the Public host name box when you added the SharePoint Web application to the Forefront UAG trunk (as described in Configuring Forefront UAG Settings). Make sure that the URL includes the protocol, according to the trunk type. 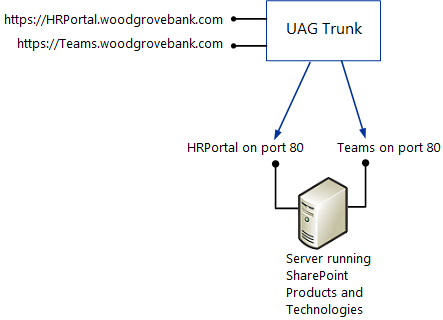 For example, if you are publishing an application via an HTTPS trunk that resides in the domain woodgrovebank.com, and the application's public host name that you entered in Forefront UAG is HRPortal, enter the following URL: https://HRPortal.woodgrove.com. Continue to the next step only if the Forefront UAG trunk via which users access the application is an HTTPS trunk, and if communication between the trunk and the server running SharePoint Products and Technologies is over HTTP (default Forefront UAG settings). In the URL protocol, host and port box, enter the internal URL of the SharePoint Web application that you assigned in the Public host name box when you added the SharePoint Web application to the Forefront UAG trunk (described in Configuring Forefront UAG Settings). Make sure that the URL includes the protocol, according to the protocol that the application uses internally. For example, if you are publishing an application that uses the HTTP protocol internally and the public host name that you entered in Forefront UAG is HRPortal, enter the following URL: http://HRPortal.woodgrovebank.com. In the Zone list, click the same zone in which you defined the public host name (in step 5 of this procedure), and then click Save.